Working remotely has many benefits for employees as well as employers. 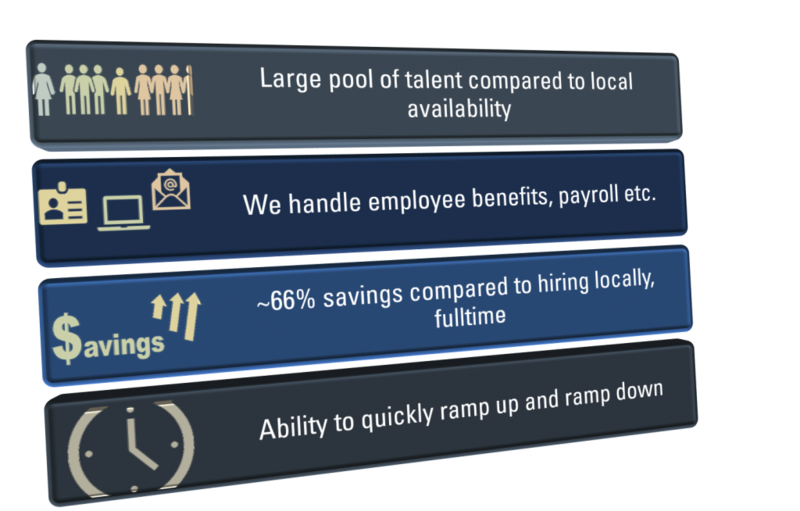 Finding talent locally may prove to be a challenge in many cases, especially when you are up against a tight budget and do not have the time to train people. Actiknow enables you to hire remote employees to work on your projects who work from our offices in India as part of your team. These BI consultants, coders and data specialists have extensive technical expertise and a very wide domain knowledge; they come at a much lower cost to the company and are available for short and long periods. One of the major benefits of hiring virtual resources vs outsourcing projects is that clients can communicate with the developers directly. The developers would be working from a development center and clients can stay in touch with them over phone calls, emails, IMs, Skype, and other channels. Hiring your virtual employee through Actiknow is as real as your own employee. Giving your employees the freedom to work remotely provides you with a large pool to choose from while keeping the cost substantially lower. A virtual employee can work for you remotely and exclusively as a dedicated part of your team without juggling other assignments.